Springtime is the time to treat our palates with bitter, pungent and astringent tastes. Pulses, spiced right, are perfect spring food because they are astringent. Knowingly, they are also “airy”, which is also a good property of food in this period when the season makes us feel heavy and tired. Nature balances itself through opposites and you can play with this concept a lot when you cook. Just remind yourself of the season’s qualities and then cook with opposite quality food. Spring is a strong period of growth. The waters of the soil start flowing in late winter bringing qualities of heaviness and coldness around but providing life giving material for nature to wake up. Structure, cohesion and bulk created by the nature bring about feelings of heaviness, stiffness and tiredness. To avoid the season’s disorders taking over your body and mind resort to food that has opposite qualities: light (e.g. pulses), stimulating and heating (spices and herbs). Cut down on heavy items i.e. reduce the use of fats and you can almost avoid dairy. Generally eat less, especially in the evenings. Sage is an optimal kitchen herb for this season. Being bitter, pungent and astringent in tastes it perfectly fits in to balance seasonal disorders. It is one of the herbs of choice for respiratory disorders, which are very typical of this season. Read more details of sage’s health benefits in Anne Macintyre’ site. 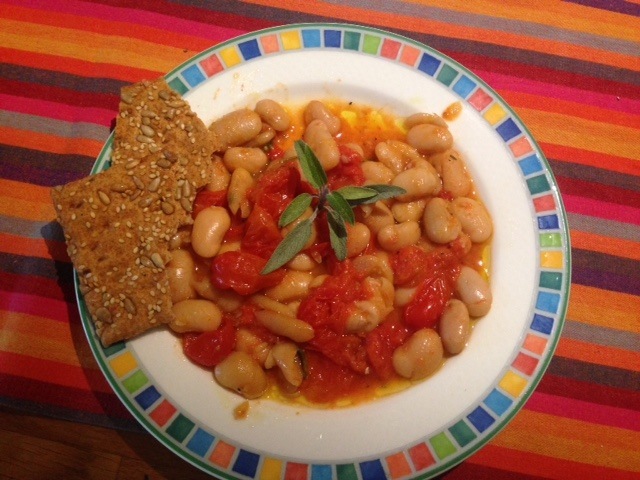 Here’s an old Italian recipe I love Fagioli all’uccelletto, which usually is made with cannellini beans. In fact, this is the original baked beans recipe. So, instead of buying ready-made ones make them yourself, which is far far better. This time I’ve used giant beans because I prefer them out of all white beans. In Italy this dish is usually offered as a side with meat or fish but it makes a perfect supper in spring. A couple of dry crackers instead of bread is a perfect accompaniment (bread should be cut down in spring). Another addition to the traditional recipe is the use of asafoedita spice (hing), which greatly reduces the gassy element of pulses. Take it as a default always to cook pulses with this gas smelling herb that actually reduces gas. Don’t be put off by the smell, you’ll be grateful for the effects. Use sparingly! Also, I’ve stopped using vegetable oils for cooking. I use ghee instead as it does not turn rancid when you heat it and it feeds the friendly bacteria in the gut. I add olive oil in the end to get the proper Italian flavor out. Cook the canned beans for 5 – 10 min in water with 5 leaves of fresh sage. If you are using dried beans then cooking takes longer and you need to have soaked the beans overnight first. Cut cherry tomatoes in half. Add ghee into a pan with crushed garlic and fresh sage. Fry on a low fire to savour the fat. Add tomatoes cut side down and put the lid on the pan. Make sure the heat is low. You want to cook the tomatoes, keep the juice and avoid burning. Add the beans once they have cooked and soft, evaporate excess liquids, add salt, pepper and asafoetida. When you serve, pour a thread of olive oil on top.